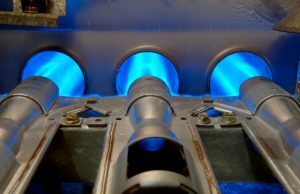 We often talk about the importance of professional inspections and tune-ups for furnaces, and we offer our Ultimate Service Agreement to deliver the best regular maintenance to our customers. This maintenance is an essential part of keeping a furnace running safely. During maintenance, our technicians will look for places where gas might escape, such as cracks in the exchanger. This gives you time to have the furnace repaired (or replaced) before the coldest weather arrives. Do you know where the shut-off valve for your natural gas line is? In some emergencies, you’ll need to shut off the gas supply with this valve, so make sure you and other adults in the house know its location. You may want to keep a screwdriver or wrench near it in case it gets stuck. Because gas furnaces are often located in basements, garages, and closets—areas also used for storage—they might have objects stacked close to them. However, you want your gas furnace to be clear on all sides. This helps prevent combustion dangers. Make sure any object that’s highly combustible (such as paint thinner) is kept far away from the furnace. We recommend testing the CO and smoke detectors in your home every six months. Press the “test” button on the front of each unit to see if it makes a beeping sound. If it doesn’t, arrange to have it repaired or replaced. If it is battery-powered, put in fresh batteries or replace with new CO and smoke detectors that have a 10-year battery life. If you don’t have CO detectors, you need to have them put in right away! We offer installation of CO detectors and smoke detectors for our customers. You can rely on us for all your furnace needs: we’re able to handle HVAC jobs the average HVAC company might not be able to handle. Call Purl’s Sheet Metal & Air Conditioning for all your heating services. “Quality Is the Cornerstone of Our Success” since 1952!